Darkly melodramatic, disturbing and beautifully shot, “Ghost Stories” is a film that rises to a higher level than most horror anthologies. Three unsolved paranormal stories are at the center of the British horror anthology Ghost Stories. The segments flow together perfectly. Add into that the stellar acting, unique stories, and a great twist ending — and this is a supernatural film that will leave genre fans haunted and satisfied. Have you ever heard footsteps you can’t explain? Have you ever felt cold spots in a warm room, heard whispers in your ear, or seen something just out of the corner of your eye? Do you believe in ghosts? Or are you like me — you want to believe, but never get the solid proof you need? The world can’t be just what we see on the surface, can it? There must be more! 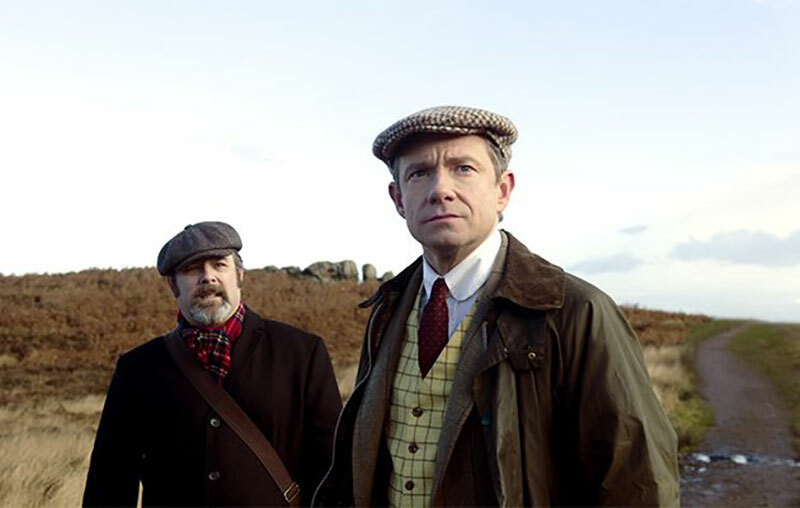 Ghost Stories is a film that evolved from a popular and successful mystery play of the same name. This series of interrelated supernatural stories brings enough chills and thrills to haunt anyone’s dreams. 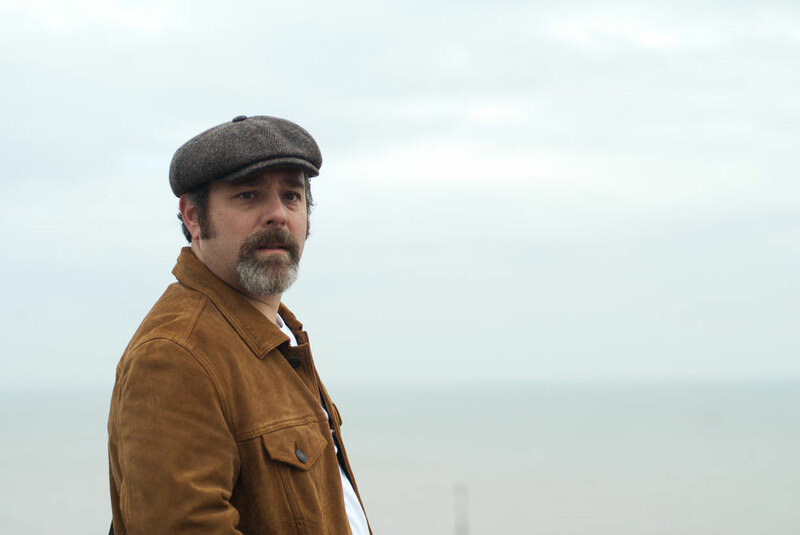 Andy Nyman and Jeremy Dyson wrote and directed this very British film in addition to the original stage production. Nyman stars in it too, playing Professor Philip Goodman, alongside favorites like Martin Freeman, who you will remember as Bilbo Baggins in The Hobbit or as Sherlock, and Alex Lawther, who I adored in the Netflix hit The End of the F**king World. Much like A Christmas Carol, three ghosts come into the life of a non-believing, cynical Professor Goodman. In this case it’s the paranormal he doesn’t believe in, and he is taken on quite an adventure by these specters. As he investigates the ghostly claims, he soon realizes each story has a connection to himself. But how can they…and why? We begin by meeting Professor Philip Goodman — a man who has spent much of his life, a lot like Houdini, debunking supposed psychics and mediums, and proving them to be fakes. It’s an emotionally difficult way to make a living, since part of what he does with his “Psychic Cheats” TV show is to announce to the public that a psychic is a fraud and is cheating their customers. Along the way, this has hurt many regular people who are just trying to find closure by contacting their dearly departed loved ones. He has a very smug attitude while doing his show and does not seem to understand how this affects other people. When Philip was a boy, he was inspired to take his career path by a paranormal investigator from the ’70s named Charles Cameron. Very similarly to himself, Charles showed the public how they can be tricked into believing in ghosts. When a mysterious package arrives at his door from Cameron, who he thought was dead, his skepticism is put to the test. He visits the dying man, who gives him the files for three cases that he never could solve or debunk. Cameron challenges Dr. Goodman to find the answers, and we follow him on this quest. He meets a night watchman (Paul Whitehouse) who worked at an abandoned and very haunted asylum, a young man (Alex Lawther) who had the worst night driving a car ever, and a soon-to-be father with a horrible and deformed poltergeist for a child. All the cases tie together in some fashion. Each one of these people have mental issues that could have explained the situations away, yet they seem to be authentic. The weirdest part is that their supernatural experiences all involve Dr. Goodman in a strange and sinister manner. The way they are all intermingled together, makes for a wonderfully creepy mystery! Are these truly ghost stories, or is he going insane? Ghost Stories absolutely fascinated me and is hands down my favorite supernatural thriller of 2018 — as well as one of the best horror anthologies ever! Everything about this film worked for me: the cold and gritty cinematography, the stellar acting (with Alex Lawther my favorite! ), the amazing and creative screenplay, and then of course, the OMG ending! This is a film you must see if you love mysteries, horror, the supernatural — or all three! The final twist at the end was so well done and unlike so many films that just stop, leaving us to figure it all out on our own. Ghost Stories brought it all together, twisted it up and left me shocked, haunted and broken hearted for our poor Professor Goodman. 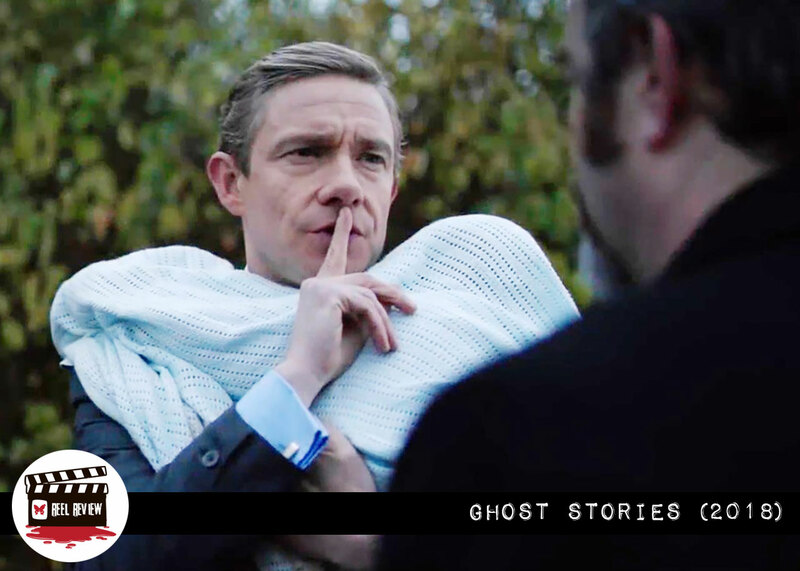 You can watch Ghost Stories on Amazon Prime, other VOD platforms and IFC Films.